I've been seeing the sign up's for Bout of Books for a good few days now and was adamant that I'd be giving this bookish event a miss... And yet here I am signing up. One of my goals for the year is to take part in more bookish events, so why give one I was keen to take part in a miss? Makes no sense. This will be my first time participating in Bout of Books, and so I'm keeping the event kind of low key for me with no specific goals or expectations. I'm just going to have fun with reading, maybe take part in some of the challenges, and hopefully meet some wonderful new to me bloggers. If you're unfamiliar with Bout of Books then you can find the general gist of the event below. 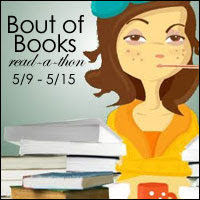 If you're taking part in Bout of Books be sure to share in the comments, so I can check out your posts, and I hope you have fun!! Have fun reading this week!! I love Bout of Books. I was telling Brandie the other day that I had no idea that Bout of Books was already upon us. I've never participated in Bout of Books but have done other readathons. I'm hoping to get in on the next BoB. Good luck meeting your goals! These bookish events really creep up on you... Especially when you're interested in participating in quite a few of them!